"Celebrating Our Music" is the theme of today's Puerto Rican day parade in New York City. 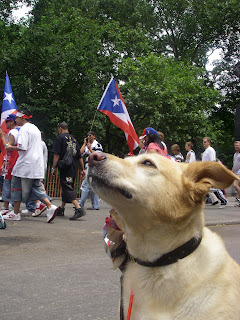 Here is MENA-UDO enjoying the Puerto Rican Day parade in New York City two years ago. 2009 celebrity honorees include New York Yankee Bernie Williams, reggaeton star Daddy Yankee, and Grammy winner Olga Tañón. The parade starts at 11 am at Fifth Avenue and 44th Street. After celebrating music, you can celebrate some great art that belongs to the Museo de Arte de Ponce. While that museum in Puerto Rico is under renovation, it's paintings are on loan. The only place you can see it's "Masterpieces of European Painting" in the Northeast is at the Bruce Museum in Greenwich through September 6, 2009. Here is an interview with the curator of Museo de Arte de Ponce, Richard Aste.